From simple syrups, eye drops, balms and pills to suppositories combining a multitude of ingredients, pharmaceutics has been a precision science since antiquity. Used through the ages to cure a vast variety of ailments and diseases, pharmaceutics has its roots in the combination of medicinal plants and roots. In fact, Hippocrates’ (ca 460 – ca 370 BC) writings mention at least 250 medicinal plants in his studies, while Galen of Pergamon (AD 129-199), the most accomplished of antiquity’s medical researchers, described in his so-called Galenic Formulations medicines that combine up to 100 different ingredients each. In AD 1300, the Byzantine physician Nicholas Myrepsos compiled a compendium of more that 2,200 medicines, many of which concerned mixtures of three to five different ingredients. This knowledge has been passed down from antiquity and remains very much alive in the present day, being used by researchers the world over in groundbreaking discoveries, while it was also the subject of a recent symposium organized by the International Hippocrates Institute of Kos on the southeastern Aegean island. According to the institute’s president, Professor Stefanos Geroulanos, the ancients mostly used herbs and other plants in their concoctions, but also minerals and animal matter such as ivory, lions’ teeth and even feces. Among the most renowned medicinal ingredients during antiquity was the so-called “Limnia Gi” or Earth of Limnos, an export product used to heal wounds which was mined from a spot almost in the center of the northeastern Aegean island and mixed with animal blood. The mixture, which contained high levels of iron, was packaged and sealed with wax. In many cases, ancient medicines worked by virtue of their placebo effect, according to scientists. Such was the case with gold, which in recent years has been hailed as a treatment for rheumatism, though conclusive studies have yet to be confirmed. In ancient times, gold dust was mixed in food and, according to Geroulanos, was the signature ingredient in the famous Viennese schnitzel, a recipe that was a closely guarded secret in the kitchens of the Palaiologos court that made its way to Vienna via Spain through wedlock. The Byzantine schnitzel owed its color to the gold dust in the crust in which the pork was cooked, while later the gold was replaced by more mundane ingredients. However, many of the healing plants and herbs of antiquity continue to be used today either in conventional pharmaceutics or in homeopathic remedies. Among these are the arbutus berry, extracts of which are still used as an anticoagulant and which Hippocrates suggested as a cure for thrombophlebitis. The European yew, or Taxus baccata, contains one of the sources of a drug used in certain types of cancer treatments, as does the periwinkle flower. Another plant that has made a comeback is wormwood, which is used to tackle malaria, as well as white willow, which Hippocrates used as an analgesic. According to the professor, they used honey mixed with water, vinegar or plant or herbal extracts. Meanwhile, another treatment that has survived from antiquity is a balm for liver spots made of warmed olive oil, beeswax and mastic gum. Author David WithunPosted on June 30, 2011 Categories religion, state, truthLeave a comment on Heresy or Blasphemy? A 1,400-year-old fresco of St Paul has been discovered in an ancient Roman catacomb. The announcement was made on the feast day of St Peter and Paul which is traditionally a bank holiday in Rome and details of the discovery were disclosed in the Vatican’s official newspaper L’Osservatore Romano. The figure is dressed in white and beige robes and with the letter ‘I’ on the hem, which may stand for ‘Iesus’ (Latin for Jesus) and it shows him approaching a dead person. 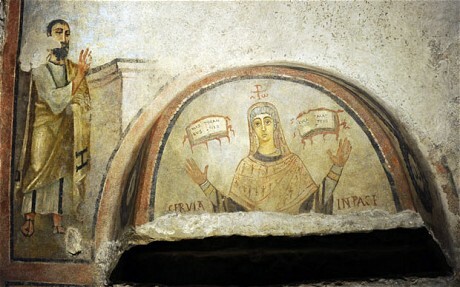 Last year another fresco of St Paul was found in another Catacomb in Rome and that was dated to the 4th century AD and is believed to be the oldest image of him in existence. He was executed for his beliefs around AD65 and is thought to have been beheaded, rather than crucified, because he was a Roman citizen. I heard this story on NPR yesterday morning on the way into work; very beautiful and inspiring. These two books, two of Nietzsche’s last books, are simultaneously one of the greatest challenges ever launched against Christianity (after that of Dostoyevsky in The Brother’s Karamazov) and are the greatest challenge to modern atheists. No matter which side of the debate you belong to — or if you are a third party altogether — Nietzsche has something to rock your world. I first read these books as a teenager and they forever changed the way that I view the world. The question that everyone who reads these books, and the rest of Nietzsche’s work, must ask themselves is what to make of the modern world. As we enter a supposedly post-Christian era, an era of which Nietzsche was certainly the forerunner and prophet, we must ask ourselves just how much of our heritage we are willing to part with as we part with Christianity. And we must ask ourselves upon what basis we will build this new, post-Christian civilization. My belief is that Nietzsche was right: the foundation will be power. Perhaps the most remarkable of all surviving Sumerian documents relating to law is a tablet that preceded Ur-Nammu’s collection of laws by about 200 years. This tablet tells a story that illuminates the notion of justice, describing reforms undertaken in the city-state of Lagash around the year 2350 BC by King Urukagina. The document begins by recounting the worst abuses of the previous regime. High taxes and oppressive laws, originally put into effect because the city-state was engaged in war, had been carried over into peacetime. Tax collectors and other corrupt royal officials were everywhere, taking donkeys and sheep from farmers and even showing up at cemeteries to seize a portion of the bread and barley that families carried to furnish the graves of their recently deceased relatives. According to this tablet, King Urukagina changed all this. He fired the dishonest tax collectors and other tainted officials, gave amnesty to citizens unjustly imprisoned, and most important, decreed ordinances protecting common citizens from exploitation by the government. In the unknown author’s account of all this, there appears for the first time in recorded history the word freedom.